Many talented chefs across the country work long hours in stressful environments for little pay. While the love of the game is what keeps most culinary masters motivated, that won’t pay the bills or build a nest egg. That’s why savvy chefs with an enterprising streak should develop multiple side income streams. Any of the following ideas can make a competent chef a mint over the years when executed wisely. In recent years, “pop-up restaurants” that exist for anywhere from an evening to a week or more have exploded in popularity. They provide customers with a novel dining experience that established eateries can rarely match. For chefs, pop-ups allow for quick profits without the fixed costs associated with long-term establishments. They also make it easy to gauge the viability of a restaurant concept. Easily one of the best ways to make money from your culinary reputation as a top chef is by creating an array of retail foodstuffs. Opting for a canned or jarred product is the smartest way to go. Boutique mustard, salad dressing, peanut butter, salsa and sauerkraut are all popular items that can sell in droves if you market the product intelligently. If you’d like to get into the catering field, targeting busy families is a wise move. Outfits like Sous Kitchen prove that this business model is a viable approach. Develop roughly a dozen different “meal packages” that include appetizers, salads and entrees to appeal to an array of consumers. One package could focus on Mediterranean fare. Another could be centered around traditional barbecue. You don’t need to crank out homemade preserves to make a fortune in the boutique food business. Rather, you could package up various high-quality products to create food baskets with a theme and mail them out to customers on a monthly basis. If you hail from an area with a great agricultural reputation like Michigan or Vermont, use your region as a theme. A YouTube channel can be a revenue bonanza in the right hands regardless of its subject matter. You could create your own version of a Food Network program by putting out a series of spectacular cooking videos. As always, experiment with different topics that will appeal to various audiences and see what connects. Publish often to get enough data to work with for analytics purposes. Nowadays, creating your own book is easy thanks to platforms such as Amazon Publishing and Lulu. All you need is a free desktop editing suite like Scribus, a solid PC or laptop and a reliable DSL or cable web connection. Use a Nikon DSLR or even your own camera phone to snap the right pictures. Failing that, Creative Commons is a great resource for royalty-free media. Imparting your knowledge to others is the easiest way to make some side scratch when you’re not behind the oven. 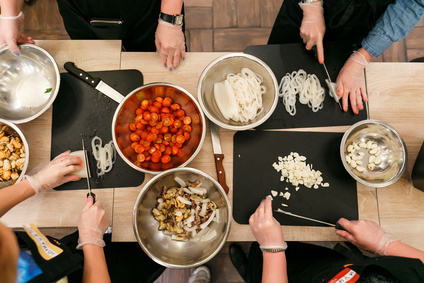 Organize a few community cooking courses and charge a few bucks per person to attend. If you want to really make some money, you could use a group chat on Skype to teach lessons for a variety of students all over the world. Whether you’re a kebab maestro or a bratwurst wizard, a food cart or truck is always a good way to bank serious cash. The key to sustainable profits is zeroing in on the right environment for your business. Annual festivals are always a great place to rake in the money as long as you match your specialty to the event in question. If you don’t mind forming a few LLCs and filing plenty of paperwork, launching a food festival can be pretty lucrative for founders. Making a festival a cash bonanza is all about gauging public interest and responding to that call. Before you launch a food festival, make connections with property owners and security professionals to ensure that your festival is well received and garners a positive reputation. If you plan out your garden in advance, you can easily grow thousands of pounds of produce every summer. As a local chef, you’re in a good position to know what local restaurants and consumers want. Take a survey before you plant butternut squash or rhubarb in great numbers to ensure that your plot returns significant profits at the end of the day. When you’re in the kitchen all day long, you get a real feel for the deficiencies of most cooking gear. Maybe you’ve got an idea for a spatula that won’t mar a good hamburger in the making. Or perhaps you’ve got an idea for a wisk that creates the perfect omelette. Either way, it’s easy to find a manufacturer to take your concept from the drawing board to Amazon. 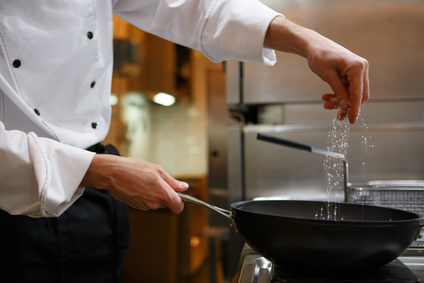 If you’re a great chef, you know the exact nutritional qualities of every meal and each ingredient in it. That puts you in the catbird seat insofar as advising certain customers on the right meal plan for their dietary needs. That’s why setting up a dietary consultancy business makes so much sense for a chef. Talk to actual dietitians in your area to figure out a game plan that won’t break any laws. Nearly every restaurant that’s launched each year will fail quickly due to the naivete of the owners. A smart restaurateur leverages the know-how of a good chef who’s in tune with the local food industry trends to ensure their success. Position yourself as an expert on what works and what doesn’t to help entrepreneurs figure out budgets, menus and so forth. No matter how smart and well-prepared you are, many of your ideas might not be successful It’s important to plan for those challenges and have a back-up blueprint in place when reality hits. If you want to make money on side businesses as a chef, try to validate your business idea as soon as possible and don’t be afraid to change course if necessary.